Background/Aims: Ledipasvir/sofosbuvir (LDV/SOF) combination is administered for 12 to 24 weeks to treat hepatitis C virus (HCV); guidelines recommend 8 weeks treatment duration for HCV genotype (GT) 1 infection based on the patient's baseline characteristics. Data on treating HCV GT4 with LDV/SOF are limited. In this prospective cohort study, the efficacy and safety of 8 weeks treatment duration with LDV/SOF was evaluated in HCV GT4 patients in Saudi Arabia. Patients and Methods: Treatment-naïve, non-cirrhotic HCV GT4 patients received LDV/SOF for 8 weeks. HCV RNA levels and laboratory evaluations were recorded at baseline and at Weeks 4, 8, and 20. The primary endpoint was sustained virologic response 12 weeks after the end of the treatment (SVR12). Safety data were also recorded. Results: Forty-five patients with a mean age of 43.9 ± 17.2 years participated, of whom 57.8% were male. Mean log10HCV RNA was 6.26 ± 6.32 IU/mL and most (91.1%) had baseline HCV RNA levels <6 million IU/mL. The most frequent comorbidities were hypertension and diabetes mellitus (20.0% each). Concomitant medication was taken by 18 patients (40.0%), of whom two took proton pump inhibitors. Overall, SVR12 was 97.8% (95% confidence interval [CI]: 88.2%–99.9%); one patient (2.2%) relapsed post treatment. No serious adverse events or discontinuations were reported. Eighteen patients (44.4%) had 38 adverse events related to LDV/SOF; the most frequent was headache. Conclusions: An 8-week regimen of LDV/SOF was well tolerated and efficacious in this treatment-naïve, non-cirrhotic HCV GT4–infected population. This study provides valuable information on a short treatment regimen for HCV GT4 infection in a real-world setting. Alternatively, an 8-week treatment duration showed similar efficacy and safety as a 12-week regimen in treatment naïve, non-cirrhotic, HCV GT1 patients. Shortened treatment durations facilitate patient compliance, which in turn may contribute to higher response rates. However, the populations in these studies consisted mostly of patients with GT1 infection, while GT4 patients were under-represented. The majority of approved DAA-based treatments for HCV GT4–infected, non-cirrhotic patients are administered for 12 weeks: elbasvir/grazoprevir, LDV/SOF,,, SOF/velpatasvir,, or the alternative regimen of ombitasvir/paritaprevir/ritonavir with or without ribavirin (RBV). More recently, 8 weeks treatment with glecaprevir/pibrentasvir for treatment-naïve and -experienced, non-cirrhotic HCV GT4–infected patients achieved SVR12 in 99%. As such, this remains the only currently approved 8-week treatment regimen for GT4. Clinical trials have strict inclusion and exclusion criteria that define the patient population under study, potentially excluding patients with comorbidities that might affect treatment outcome. The question arises whether trials reflect the “real-world” clinical experience of patients undergoing treatment for HCV infection. In the case of HCV infection, several studies have reported an association between HCV and liver-related extrahepatic comorbidities, such as diabetes mellitus, which can affect HCV disease progression and response to treatment. Concomitant medications can also affect HCV treatment efficacy and safety. The availability of data sourced from a real-world context provides valuable support to data derived from large-scale clinical trials in highly specific populations. We conducted a prospective, observational study on the outcome of shortened treatment duration of 8 weeks of LDV/SOF in treatment-naïve, HCV GT4-infected patients at a single center in Saudi Arabia. The aim of the study was to evaluate the safety and efficacy of this regimen, alongside the potential impact of comorbidities and concomitant medications on the treatment outcomes. This real-world, prospective study included consecutive adult patients with HCV GT4 infection that were treatment-naïve, non-cirrhotic, and not co-infected with human immunodeficiency virus (HIV) or hepatitis B virus (HBV). Patients included were from the hepatology clinics of the King Fahad Hospital, Jeddah, Saudi Arabia, and provided written informed consent prior to their details being collected for the purpose of this study. This study was approved by an institutional review board (IRB) committee at King Fahad Medical City, Riyadh, Saudi Arabia (IRB log number: 16-144E) and was conducted in accordance with Good Clinical Practice and the Declaration of Helsinki. Data were collected at four visits: baseline, Week 4, Week 8, and Week 20, and were recorded on spreadsheets (Excel, Microsoft Office). At the baseline visit, demographic information, presence of comorbidities, concomitant medication, and non-cirrhotic status (assessed by a Fibroscan value below 12.5 kPa) were reported and the patients provided blood samples for laboratory tests, including HCV GT and viral load determination. HCV GT was determined by sequencing technology with the Abbott System (Abbott Laboratories, Abbott Park, Illinois, USA). Hepatitis C RNA was measured at all visits using the COBAS AmpliPrep/COBAS TaqMan HCV Quantitative Test assay (v. 2.0, Roche Diagnostics). The lower limit of quantification (LLOQ) for this assay was 15 IU/L. All patients received a treatment regimen of LDV 90 mg/SOF 400 mg in a single combination tablet (Harvoni ®, Gilead Sciences) for 8 weeks. Efficacy of the treatment was assessed at Week 4 and Week 8 (end-of-treatment; EOT) and after 12 weeks of treatment completion. Sustained virologic response (HCV RNA below LLOQ) at 12 weeks after the EOT (SVR12) was the primary efficacy endpoint and was evaluated by an intent-to-treat (ITT) analysis (including patients who died or lost to follow-up as treatment failures) and by a per protocol (PP) analysis (excluding patients who died prior to collecting all clinical data or were lost to follow-up). Patient records were maintained for any adverse events (AEs), both the clinical events and any abnormal findings on laboratory tests. Safety data were determined during treatment and at each clinic visit, and included a self-filling questionnaire given to the patient during treatment and at each visit (including follow-up ones). Relapse was defined as a detectable HCV PCR result after the treated patient had already achieved the HCV RNA levels below LLOQ. AEs experienced by the patients were recorded by the treating physician and were judged using the standard definitions of International Conference on Harmonisation–Good Clinical Practice (ICH-GCP). According to the ICH guidelines, an AE was considered serious if it resulted in death, was life-threatening, required inpatient hospitalization or resulted in prolongation of existing hospitalization, resulted in persistent or significant disability/incapacity, was a congenital anomaly/birth defect, or was a medically important event or reaction. 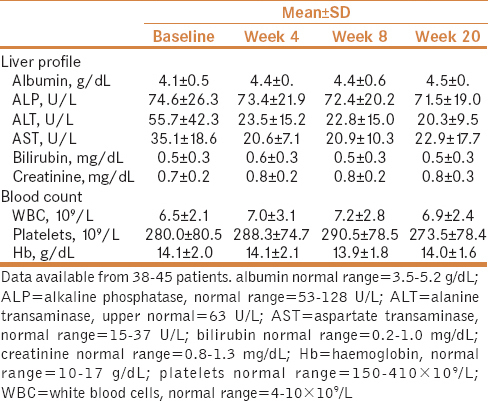 Liver function and blood tests were performed at baseline and at all subsequent visits and included measurements of alanine aminotransferase, aspartate aminotransferase, bilirubin, alkaline phosphatase, creatinine and albumin, white blood cells, platelets, hemoglobin, and alpha fetoprotein levels. The ITT population included all patients who started treatment between March 30, 2016, and February 15, 2017. The PP population included all patients that completed the 8-week treatment; patients were asked at each visit and at follow-up to confirm that they had complied with the treatment. Mean and standard deviation were calculated for continuous variables. Descriptive statistics were performed and two-sided 95% confidence intervals (95% CI) were calculated for the proportions. Categorical variables were presented as numbers (n) and percentages of the study population. Efficacy and safety analyses were conducted using the PP population. 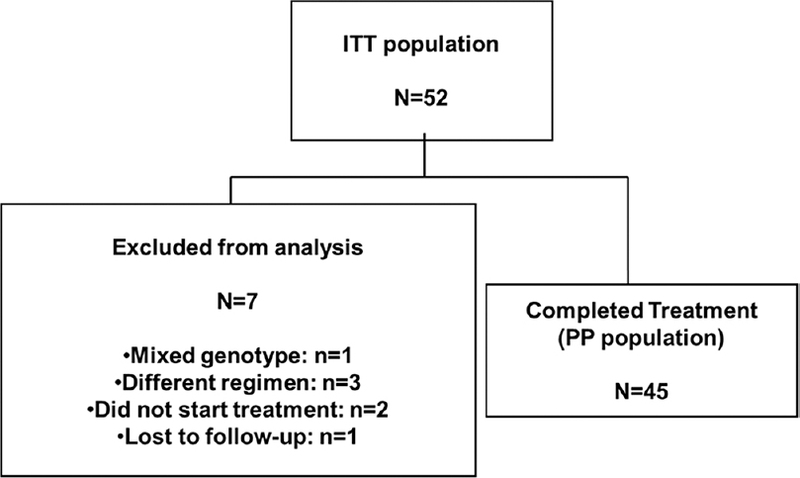 A total of 52 HCV patients with GT4 were initially considered for the study (ITT population). Seven patients were excluded from the final analysis: one patient was infected with mixed HCV GT1a and GT4, three patients continued treatment for a 12-week duration, two patients never started treatment, and one patient was lost to follow-up [Figure 1]. Forty-five patients were included in the PP population with a mean age of 44.0 ± 17.2 years; most were male (26 [57.8%]) [Table 1]. Mean HCV RNA log10 at baseline was 6.25 ± 6.32 IU/mL and 42 patients (93.3%) had a baseline HCV RNA below 6 million IU/mL. Overall, 33 (73.3%) patients had a fibrosis score of F1; seven patients (16.6%) had a fibrosis score of F0 and five patients (11.1%) had a fibrosis score of F2. Comorbidities were present in a total of 15 (33.3%) patients. The most frequent comorbidities were diabetes mellitus and hypertension, each diagnosed in nine patients (20.0%). Eighteen patients were taking concomitant medication; two patients (4.4%) were taking PPIs. At the end of the treatment (Week 8), all patients had HCV RNA < LLOQ (results not shown). At Week 20, 97.8% patients (44/45, 95% CI: 88.2–99.9) in the PP population achieved SVR12. One patient relapsed at Week 20 (post treatment relapse) with an HCV RNA log10 value of 5.74 IU/mL. The patient was a 66-year-old male who had diabetes mellitus and hypertension and a fibrosis score of F2. His concomitant medications were insulin, celecoxib, esomeprazole, amlodipine, and levocetirizine. The patient did not experience any AEs during the study. Three patients (6.6%) had a viral load RNA value more than 6 million IU/mL at baseline and all of them achieved SVR12. There were no deaths, serious AEs, or early discontinuations due to AEs related to the study drug. Overall, 18 of 45 patients (40.0%) experienced 38 AEs [Table 2]. The most frequent AE was headache with 10 reported events (26.3%) in equal number of patients followed by fatigue (18.4%), reported by seven patients. None of the AEs was judged serious or severe; AEs were mild (Grades 1–2). All 38 events were judged by the investigator to be related to LDV/SOF. All events were transient and resolved during the study. There were no clinically significant laboratory events reported as AEs. Mean values for liver enzymes and blood counts were within the normal laboratory range at all visits [Table 3]. Recent studies have shown high SVR12 rates using combinations of LDV/SOF treatment without RBV administered for 12 weeks in patients with GT4 infection. In one single center, open-label cohort treatment was administered in 13 treatment-naïve and eight previously treated patients with GT4 infection for 12 weeks. Twenty (95%) of the 21 patients achieved SVR12. In another study, 41 of the 44 (93%) patients achieved SVR12 after a 12-week LDV/SOF regimen. Treatment was well tolerated with non-serious AEs reported in 31 patients (71%). These studies confirmed the high efficacy of a 12-week treatment LDV/SOF in patients with HCV GT4 infection, but real-world data are scarce from countries where HCV GT4 infection is prevalent. A recent real-world experience from Saudi Arabia with LDV/SOF in GT4 (n = 213) revealed an SVR12 of 90% to 93% in decompensated and compensated patients. Thus, it becomes obvious that 12 weeks of treatment duration with LDV/SOF is sufficient for cirrhotic patients, clearly leaving the door open for a shorter duration in non-cirrhotic GT4 patients. Following recommendations for a shorter treatment duration of 8 weeks with LDV/SOF for non-cirrhotic treatment-naive HCV GT1 patients, our study provides valuable real-world evidence in GT4 infection. Recent clinical trial data in Egyptian patients with HCV GT4 infection showed that of the 85 treatment-naïve non-cirrhotic patients treated with LDV/SOF for 8 weeks, SVR12 rates were 90% with RBV and 95% without RBV. These findings are in concordance to ours, except that our cohort did not have a combination with RBV. We have previously demonstrated the futility of RBV addition in enhancing the efficacy of LDV/SOF in GT4. In the afore-mentioned real-world cohort from Saudi Arabia, the use of RBV did not result in higher SVR12 rates in the overall cohort (91.8% vs. 94.0% without RBV), including in those with compensated cirrhosis (93.1% vs. 93.9% without RBV). In this study, one patient relapsed post treatment. The patient had a baseline HCV RNA below 6 million IU/mL and an F2 fibrosis score and had been diagnosed with diabetes mellitus and hypertension. In this study, no information was available for the GT4 subtype infection and baseline resistance associated substitutions (RASs) of the patients which feasibly could have offered more insights, including on the cause of relapse. In addition, previous studies have showed an association between diabetes and HCV, and diabetes has a higher prevalence in HCV patients than in the general population. Furthermore, DAA therapy has shown to improve glycemic control. In this study, the presence of diabetes did not appear to affect the treatment outcome as the remaining eight patients with diabetes mellitus completed treatment and achieved SVR12. Two of our patients were on PPI therapy, of which one did not achieve SVR12. PPIs may impact efficacy among HCV patients who are treated with LDV/SOF by affecting LDV solubility and hence its absorption. However, Tapper et al. showed that after propensity matching for PPI use, there were no significant associations between SVR12 and any dose or frequency of PPI use. Nonetheless, PPI use with LDV/SOF therapy remains a concern, and as such, it is recommended that the daily dose of PPIs during HCV treatment with LDV should not exceed the equivalent of 20 mg omeprazole. One of the limitations of this study is the size, as a cohort of 45 patients limits the scope to draw definitive conclusions especially in relation to the effect of comorbidities and concomitant medications on LDV/SOF treatment. However, this study adds to the accumulating evidence of the 8 weeks regimen in GT4 patients. The clinical trial data of Shiha et al. with the 8 weeks treatment is certainly a step in the right direction. However, data from this trial are burdened with the heterogeneous nature of the overall cohort, with disparate patient groups including treatment-naïve and -experienced, cirrhotic and non-cirrhotic patients, subjected to treatment for 8 or 12 weeks, with or without RBV. On the contrary, our treatment cohort is a vastly homogeneous one where one uniform treatment regimen was used for non-cirrhotic treatment-naïve patients. Consequently, this allows for clearer but succinct interpretation and application of the results in clinical practice. Another limitation of our study is that it does not provide information on the HCV GT4 subtypes; identification of HCV GT subtypes may be important for treatment determination, resistance, and outcome. It is worthy though to note that Saudi GT4 subtype distribution includes all subtypes (48.4% Subtype 4a; 39.0% Subtype 4d; 12.5% mixture of the various other subtypes). Studies from Egypt generally include the Subtype 4a, where the particular strain predominates. Finally, although this study included non-cirrhotic patients, which by implication also includes advanced (F3) fibrosis, none of our patients harbored F3 fibrosis, and hence, efficacy generalizations from our results can only be extended to F0-F2 populations. Nonetheless, the need for larger real-world studies of shorter treatment durations with LDV/SOF, including patients with comorbidities, F3 fibrosis, and HCV GT4 subtype diversity, is paramount. In conclusion, our results suggest that a treatment regimen of 8 weeks with LDV/SOF without RBV in treatment-naïve, non-cirrhotic patients with HCV GT4 is well tolerated and highly effective. The real-world data from this study provide valuable information on the presence and effect of comorbidities and concomitant medications that should be further evaluated in larger real-world cohorts of HCV GT4 infected patients. All procedures followed were in accordance with the ethical standards of the responsible committee on human experimentation (institutional and national) and with the Helsinki Declaration of 1975, as revised in 2008. Informed consent was obtained from all the patients for being included in the study. The data analysis and writing of the manuscript were conducted by Dr. Antigoni Ekonomou of Niche Science and Technology Limited and were supported by Gilead Sciences. Dr. Mohammed Babatin has received fees as a member of advisory committees and as an invited speaker from Merck Sharpe Dohme, Bristol-Myers Squibb, Janssen Pharmaceuticals, Gilead Sciences, and AbbVie. Dr. Abdullah AlGhamdi has received fees as a member of advisory committees and as an invited speaker from Merck Sharpe Dohme, Bristol-Myers Squibb, Janssen Pharmaceuticals, Gilead Sciences, and AbbVie. Professor Tarik Asselah has received funds as a speaker and investigator from AbbVie, Bristol-Myers Squibb, Janssen Pharmaceuticals, Gilead Sciences, Roche, and MerckSharpe Dohme. Dr. Faisal M. Sanai has received fees as a member of advisory committees and review panels from Merck Sharpe Dohme, Bristol-Myers Squibb, Janssen Pharmaceuticals, Gilead Sciences, and AbbVie; as a tutor and speaker from Roche Pharmaceuticals, Janssen Pharmaceuticals, Gilead Sciences, Bayer Schering, and AbbVie; and he has also received grant/research support from Roche Pharmaceuticals and Bristol-Myers Squibb. Drs. Abdullah Assiri, Haziz AlBeladi, Hammad S. AlOthmani, Mohammed Mogharbel, Ashwaq AlSahafi, and Wedad Mahallawi declare no conflict of interest. Lauer GM, Walker BD. Hepatitis C virus infection. N Engl J Med 2001;345:41-52. Messina JP, Humphreys I, Flaxman A, Brown A, Cooke GS, Pybus OG, et al. Global distribution and prevalence of hepatitis C virus genotypes. Hepatology 2015;61:77-87. Al Ashgar HI, Khan MQ, Al-Ahdal M, Al Thawadi S, Helmy AS, Al Qahtani A, et al. Hepatitis C genotype 4: Genotypic diversity, epidemiological profile, and clinical relevance of subtypes in Saudi Arabia. Saudi J Gastroenterol 2013;19:28-33. Hepatitis C virus (HCV) guidance: Recommendations for testing, managing, and treating hepatitis C. American Association for the Study of Liver Diseases (AASLD) Guidelines 2018. Available from: http://www.hcvguidelines.org/. [Last accessed 2018 June 10]. Kohli A, Kapoor R, Sims Z, Nelson A, Sidharthan S, Lam B, et al. Ledipasvir and sofosbuvir for hepatitis C genotype 4: A proof-of-concept, single-centre, open-label phase 2a cohort study. Lancet Infect Dis 2015;15:1049-54. Abergel A, Metivier S, Samuel D, Jiang D, Kersey K, Pang PS, et al. Ledipasvir plus sofosbuvir for 12 weeks in patients with hepatitis C genotype 4 infection. Hepatology 2016;64:1049-56. Sanai FM, Altraif IH, Alswat K, AlZanbagi A, Babatin MA, AlMousa A, et al. Real life efficacy of ledipasvir/sofosbuvir in hepatitis C genotype 4-infected patients with advanced liver fibrosis and decompensated cirrhosis. J Infect 2018;76:536-42. Alghamdi AS, Alghamdi M, Sanai FM, Alghamdi H, Aba-Alkhail F, Alswat K, et al. SASLT guidelines: Update in treatment of Hepatitis C virus infection. Saudi J Gastroenterol 2016;22(Suppl):S25-57. Kowdley KV, Gordon SC, Reddy KR, Rossaro L, Bernstein DE, Lawitz E, et al. Ledipasvir and sofosbuvir for 8 or 12 weeks for chronic HCV without cirrhosis. N Engl J Med 2014;370:1879-88. Younossi ZM, Park H, Gordon SC, Ferguson JR, Ahmed A, Dieterich D, et al. Real-world outcomes of ledipasvir/sofosbuvir in treatment-naive patients with hepatitis C. Am J Manag Care 2016;22:SP205-11. Asselah T, Reesink H, Gerstoft J, de Ledinghen V, Pockros PJ, Robertson M, et al. Efficacy of elbasvir and grazoprevir in participants with hepatitis C virus genotype 4 infection: A pooled analysis. Liver Int 2018. doi: 10.1111/liv. 13727. [Epub ahead of print]. Shiha G, Esmat G, Hassany M, Soliman R, Elbasiony M, Fouad R, et al. Ledipasvir/sofosbuvir with or without ribavirin for 8 or 12 weeks for the treatment of HCV genotype 4 infection: Results from a randomised phase III study in Egypt. Gut 2018. doi: 10.1136/gutjnl-2017-315906. [Epub ahead of print]. Feld JJ, Jacobson IM, Hézode C, Asselah T, Ruane PJ, Gruener N, et al. Sofosbuvir and velpatasvir for HCV genotype 1, 2, 4, 5, and 6 infection. N Engl J Med 2015;373:2599-607. Everson GT, Towner WJ, Davis MN, Wyles DL, Nahass RG, Thuluvath PJ, et al. Sofosbuvir with velpatasvir in treatment-naive noncirrhotic patients with genotype 1 to 6 hepatitis c virus infection: A randomized trial. Ann Intern Med 2015;163:818-26. Hézode C, Asselah T, Reddy KR, Hassanein T4, Berenguer M, Fleischer-Stepniewska K, et al. Ombitasvir plus paritaprevir plus ritonavir with or without ribavirin in treatment-naive and treatment-experienced patients with genotype 4 chronic hepatitis C virus infection (PEARL-I): A randomised, open-label trial. Lancet 2015;385:2502-9. Asselah T, Kowdley KV, Zadeikis N, Wang S, Hassanein T, Horsmans Y, et al. 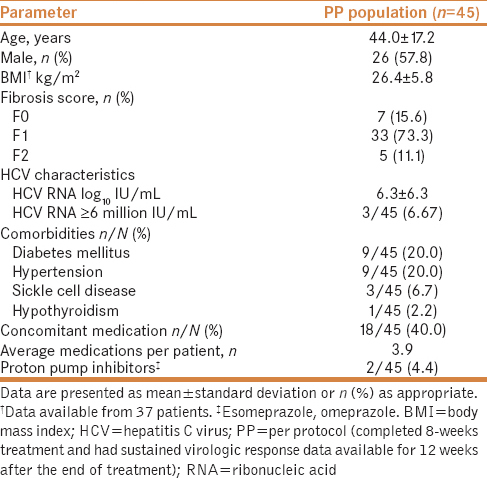 Efficacy of glecaprevir/pibrentasvir for 8 or 12 weeks in patients with hepatitis C virus genotype 2, 4, 5, or 6 infection without cirrhosis. Clin Gastroenterol Hepatol 2018;16:417-26. Chehadeh W, Kurien SS, Abdella N, Ben-Nakhi A, Al-Arouj M, Almuaili T, et al. Hepatitis C virus infection in a population with high incidence of type 2 diabetes: Impact on diabetes complications. J Infect Public Health 2011;4:200-6. Mehta SH, Brancati FL, Sulkowski MS, Strathdee SA, Szklo M, Thomas DL. Prevalence of type 2 diabetes mellitus among persons with hepatitis C virus infection in the United States. Ann Intern Med 2000;133:592-9. Dawood AA, Nooh MZ, Elgamal AA. Factors associated with improved glycemic control by direct-acting antiviral agent treatment in Egyptian type 2 diabetes mellitus patients with chronic hepatitis C genotype 4. Diabetes Metab J 2017;41:316-21. Backus LI, Belperio PS, Shahoumian TA, Loomis TP, Mole LA. Real-world effectiveness and predictors of sustained virological response with all-oral therapy in 21,242 hepatitis C genotype-1 patients. Antivir Ther 2017;22:481-93. Tapper EB, Bacon BR, Curry MP, Dieterich DT, Flamm SL, Guest LE, et al. Evaluation of proton pump inhibitor use on treatment outcomes with ledipasvir and sofosbuvir in a real-world cohort study. Hepatology 2016;64:1893-9.